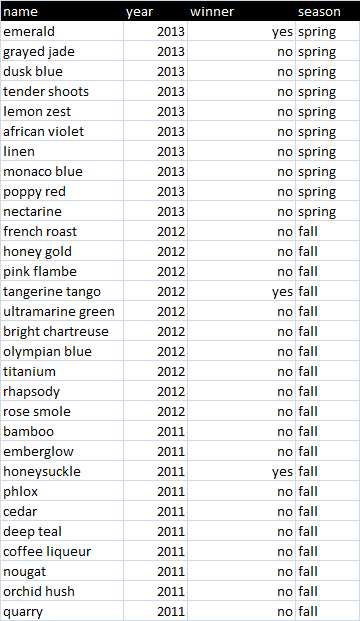 Alternative schemes showed Ramping color swatches using the Pantone spring 2013 collection colors as the ramp milestones. So far we’ve been laying out a linear ramp. How about a circular one? Luckily How to create a heatmap doughnut chart could be used to layout both the scheme and its ramp. 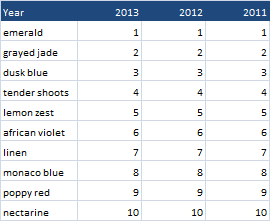 So how about showing multiple columns. and we get this.. we can see the tone changing over the past 3 years. So that doesn’t really look to great, so we can change the plotting granularity parameter from the default of 300 to 1 and we get this.